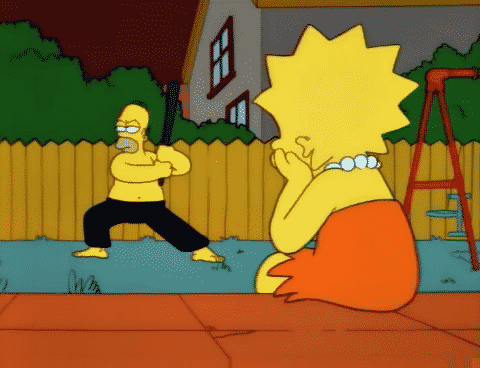 1 Top 7 Simpsons Gags You Missed | This Blog Rules | Why go elsewhere? The Simpsons is truly the longest sitcom in the United States, with 27 seasons spanning over 26 years and almost 600 episodes. The witty writers of the series have not only extraordinary talent in comedy, but also in subtly including hints towards various aspects, from politics to history or other famous works. We have compiled a list of the top 7 Simpsons gags you missed, unless you were precisely looking for them. You can spot the sign near the right corner of the image. 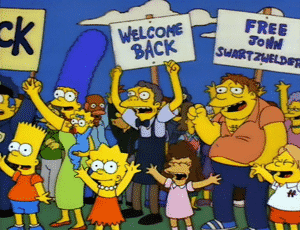 John Swartzwelder is the name of the most famous writer of The Simpsons. However, he is a very private person, being rarely seen in public. This fact has also led many fans to believe that the name was made up in order to keep the real writer anonymous. As a result, the other writers included hints to Swartzwelder in some episodes. For instance, the writer appears as a paranoid man at a mental facility in the “Hurricane Neddy” episode. The number on Skinner’s old helmet is the same as Valjean’s prisoner number. When Seymour Skinner, the school principal, revealed his true identity, we have all seen the uncanny resemblance with the life of Jean Valjean from Les Miserables, as they both took on different identities. 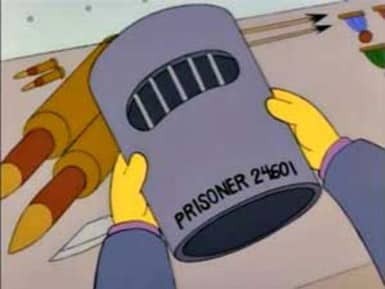 However, there was an earlier hint in a previous episode when Skinner found his POW helmet with the number 24601. Jean Valjean had the same prisoner number. 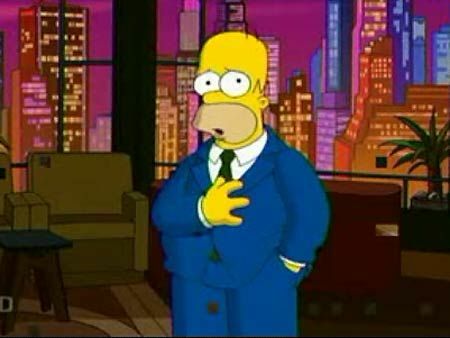 Homer impersonated Johnny Carson while eating prized potato chips. There is this episode when Homer eats some prized potato chips which look like famous people. This is a reference to one of The Tonight Show episodes with Johnny Carson from the 1980s. In the show, the guest was a woman who presented a series of potato chips shaped like animals, numbers and so on. When she turned around for a moment, Carson took one chip from another bowl and loudly ate it, making the audience laugh and the woman watch in shock. You can spot the name of the vice president on the shredded paper. The Simpsons series was heavily criticised by President Bush and his wife. The writers of the series responded in style, by including them in some episodes. However, they also included a reference to Dan Quayle, the Vice-President of the Bush administration in order to remind their viewers of their incompetence. 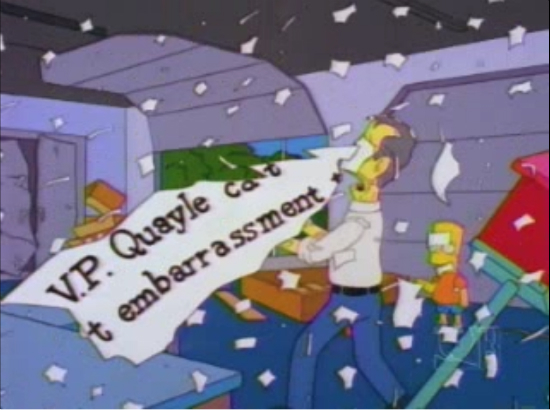 A torn paper with the name of Quayle and the word “embarrassment” can be seen flying around when Bart shredded Bush’s memoirs. The Whacking Day episode included a lot of references to President Nixon. During the Whacking Day episode, Bart got home-schooled and started reading history books. Although hidden among the President Nixon jokes, we have also remarked that the author of the book “The Truth About Whacking Day” is Bob Woodward. The Watergate scandal was uncovered by Woodward along with other journalists. Mr Burns’ greeting has a history. Mr Burns is definitely a very weird guy, and one of the most well known things he does is answering the phone by saying “ahoy hoy”. This comes from the very first way of saying hello, back when telephones were first invented. It was Thomas Edison who changed it to “hello”. The joke also hints at Mr Burns’ old age. 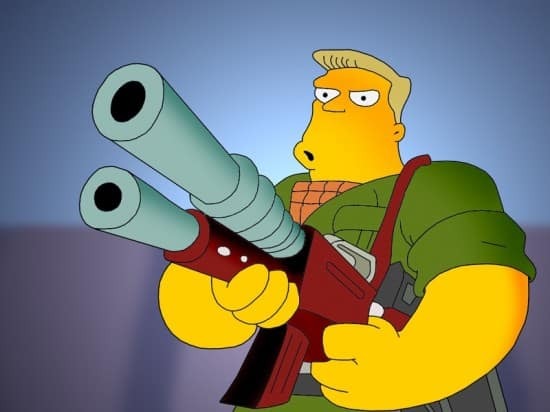 McBain, played by Rainier Wolfcastle, is a replica of Arnold Schwarzenegger. You may have seen many appearances of McBain throughout various episodes. However, if we collect all these mini clips and put them in order, we end up with a whole movie. The sequence begins with McBain arguing with the Captain, followed by a bar scene where McBain’s partner is assassinated. The story continues with the protagonist going after Mendoza, the villain. In the end, the hero prevails and defeats the villain.